Hostel Pisa i Pisa, Italien : Boka nu! Group bookings are not refundable. No modifications / Amendments allowed, except for adding guests. -A 5€ Room Key deposit is required on arrival (cash) for each room Key. -No Alcohol from outside is allowed on the premises. 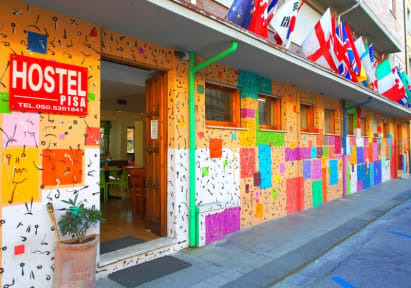 The biggest, most popular and most comfortable located youth hostel in Pisa, just 5 minutes by walk from Pisa Centrale Train Station and only 12 minutes by walk from Pisa Airport. The most iconic sight; the world famous Leaning Tower of Pisa, will just be a pleasant and interesting 20 minutes walk. Otherwise a bus from the Airport and to the Leaning Tower stops right outside our door. For us, Hostelling means appreciating the experience of Hostelling, the social aspect, the information, the different views, the 'being part of a family' away from your own. The highlight of a hostel, is the common area, where people from all over the world meet, talk, socialize, play billiard, chess etc. Offering a huge indoor and outdoor area, and considering the size of our hostel and the large number of guests we can host, you will find a very social atmosphere, perfect for single travelers or friends but also for couples. Our in-house Cafè/Restaurant is your best value and most tasty but healthy option for your breakfast, lunch and dinner. Chill out cafè where you can enjoy your snacks and drinks, and a perfect social place to spend the evenings, surrounded by people that share your passions: travelling the world and making new friends. Jätte trevliga! Hjälpsamma om man hade några frågor. Bra läge, inte långt till varken flyg, tåg eller lutande tornet. Vi var ett gäng på 7 tjejer som bodde här för att upp leva Pisa en dag. Innan vi åkte till havet. Perfekt att bo här då! Super bra hostel! Dock inget kök, men många alternativ i "restaurangen", mycket vegetarisk, och annan specialkost. Trevlig personal. Central hostel with many dormitories. Lobby functions as common room and as restaurant with staff providing lots of meals (breakfast, lunch + dinner) and beverage (alc + non-alc). Nice outside area however lots of mosquitoes. Very modern and feels almost like a restaurant. Drawback is no fridge or kitchen for guests to use. The Rooms are nice, clean and comfortable. We stayed an extra night just to chill. Really liked this place! Nice staff all around, good with 24/7 food if you are ever feeling hungry. Had a really good common area, really mixed groups of people though. Both backpackers and families and so on. Feels like the common room outside should be more used by the people but some guys still wants to hang around by themselves. Would definitely recommend this place! Only bad thing for me was that the luggage storage before checking in was not really secure. Everything else was pretty good! Very clean place! It’s a bit bad that you’re not allowed in the room between 12-15 though. The food is okay, the hostel is nice and I had a lot of fun here! Nothing to complain about. Nice hostel not far from the train station which fit us on our interrail journey. About 20 min walk from the tower which we didn't mind. The hostel had a lot of activities during our stay it was beer pong (didn't join). Very nice location close to the station! Bad ”kitchen” without any equipment, no fridge. 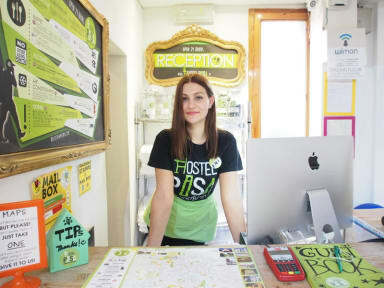 You can buy food at the hostel. Friendly staff. You have to leave a key deposit of 5 € in cash. You can leave bags after check-out but there are no lockers/locked luggage room.